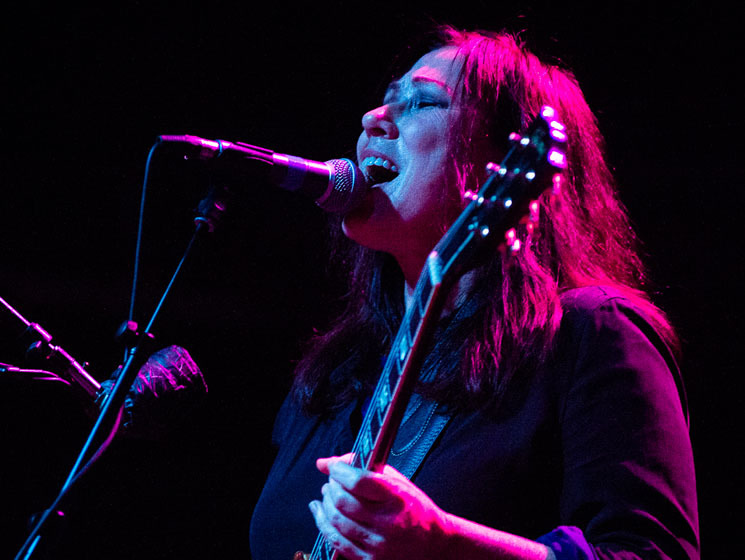 The Breeders, arguably, are more influential now than they've ever been. More than a quarter century into their intermittent career, the band — and sole constant Kim Deal in particular — find themselves spirit animals to a new generation of American bands mixing fuzzy, confessional indie and punk sounds. Yet the Toronto stop on their current tour belied none of this; rather, it put band dynamics on full display to often hilarious effect. The interactions between twin sisters Kim and Kelley Deal, already stationed up front in the spotlight, could be their own standalone show. Taking the stage, Kim offered a quick hello to the crowd. "We're going to play some songs for you," and proceeded to do just that, kicking things off with "New Year" from Last Splash, followed by "Wait in the Car" and the title track from their very good new record, All Nerve, setting the tone as they toggled between old favourites and new material. But Kim also toggled between guitars with equal frequency and the momentum built from each performance was abruptly halted while she readjusted her pedals, amps and axe over and over again. A faulty stomp box threatened to derail things completely early in the set, while deeper into the night, she had to add an entire new piece to her pedal board mid-set. Kelley was a saving grace, taunting her sister the way only family can. She gave voice to the packed crowd's thinning patience, while simultaneously placating it. That said, Kim's perfectionist streak ensured that the performances themselves were peerless. If you've spent a couple decades listening to but never seeing the band, the vocal and guitar interplay between the Deal sisters is uncanny. Kim ribbed her sister introducing the Kelley-sung "I Just Want to Get Along," noting that she wanted to share some feelings. And while the bulk of the night's selections came from Last Splash and All Nerve, the only two Breeders records that drummer Jim MacPherson played on, the quartet did dip into the underrated Title TK for "Huffer" and "Off You," performed a handful of tracks from Pod and even pulled out "Safari" from the 1992 EP of the same name. "Cannonball" and their slow-burning cover "Happiness is a Warm Gun" both appeared in the main set, which ended with Kim's Pixies coup de grâce, "Gigantic." One would think that would be hard to top — a girl standing next to me screamed "Oh my god!" as Kim plucked "Gigantic's" opening bass notes. But "Saints," "Nervous Mary" and "Do You Love Me Now?" provided an oddly fitting end to the night. The push-pull between visceral feel and technical precision was on full display throughout the set, and the degree of the band's success ultimately came down to where you fall on that spectrum. What was clear was that a Breeders gig, for better or for worse, is the Deals' world. The rest of us are just living in it.